MUFF WIGGLER :: View topic - OK just bought a harvestman piston honda. Manual? OK just bought a harvestman piston honda. Manual? Does anyone know where I can get a manual for the Piston Honda? Closest thing will be a video Surachai made. Search YouTube. here's the unofficial version i've put together over the last few years . some new info , and some copy and pasted from the best respective threads. 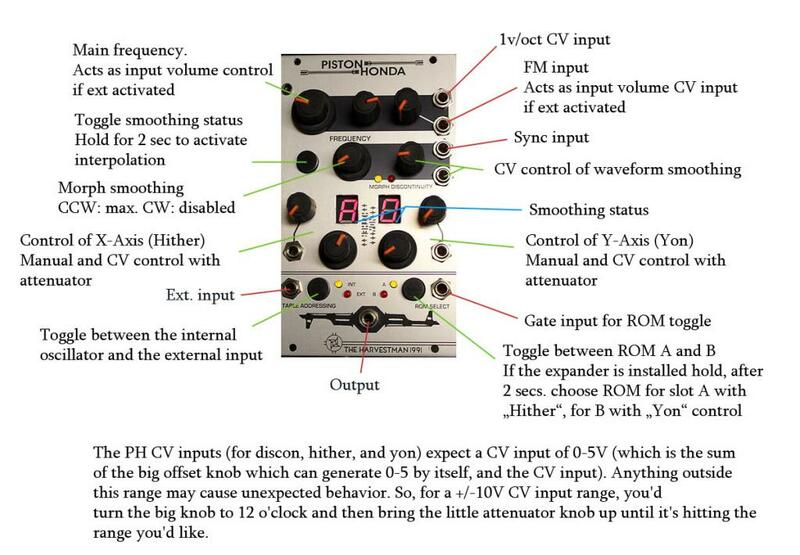 - model 1991 "piston honda"
Wavetable oscillator with variable interpolation resolution. Two ROMs are onboard, each containing 256 waveforms in 16 banks. Waves may be smoothly morphed or violently jumped in two dimensions. It's up to you. The degree of discontinuity these waveform changes is voltage controllable. why not plug in an external oscillator or anything else? You can also use a gate input to instantly toggle between ROM chips. An optional expansion board provides six more ROM sockets for use with Blacet/Wiard-format waveform data. Use wave256 software to write your own data. Slots for 6x serial EEPROM. Miniwave/Waveform City format data. Max current draw is in the neighborhood of 120 like the Donut. Waveforms can be scanned manually and also with CV. Morph Discontinuity determines length of transition. Higher value knob settings on the the morph discontinuity cause sharper transitions. Lower values cause the transitions to be smoothed. Holding the Wave Discontinuity button (lights on) smooths out digital artifacts. External signals can be processed. In this mode the frequency knob acts as a pseudo volume gain control. Rom Select can be selected manually or with gates. Hard Sync and FM are both achievable by sending audio rate (Hard Sync) or LFO (Hard Sync and FM) signal to the Frequency jacks. The decimal points on each of the number displays represents whether interpolation is turned on for each of the axes (named HITHER and YON). On powerup, interpolation is disabled for HITHER and enabled for YON. To toggle through them, press the top left button. Hold this button down for two seconds to light the two orange LEDs. When they are lit, waveform smoothing is enabled. It works best on waveforms with gentle slopes like sines, and can greatly decrease quantization noise if that's your preference. The MORPH DISCONTINUITY control adjusts how stepped the interpolation is when enabled. At full CCW it is as smooth as possible, at full CW it's like the interpolation is disabled. Somewhere inbetween, with 4-16 steps between each stored waveform, you can nail the Konami SCC sound pretty well if you use this effect with the noisy waves in the neighborhood of ROM A HITHER 0-3 YON 8-F. The ROM SELECT button toggles between the A ROM (harsh) and B ROM (additive). A logic HIGH applied to the nearby GATE input will toggle the selection. If you have a ROM expander board installed, you can hold down the ROM SELECT button for 2 seconds and the display will change. Use the HITHER knob to select the ROM chip to be selected for the A slot (what gets selected by the button and gate input), and the YON knob to select the chip for the B slot. You can select chips named A-H in this mode, A and B are the factory waveforms and the remaining six represent the sockets on the expander board. Release the select button to return to normal operation. Just like the donut, keep your CVs for the three main inputs within 0-5V range for best results, you can police your voltage levels by using the provided offset controls (big knob) and attenuators (little knob). The interpolation that causes the two orange LEDs to light (by holding down the button) is the waveform smoothing. For the smooth morphing on Hither or Yon, tap that button (dont hold it) until the decimal point lights on the display for the dimension you'd like to be smooth. The Piston boots up with morphing enabled on Yon and disabled on Hither and you can have all four combinations of either, none, or both. 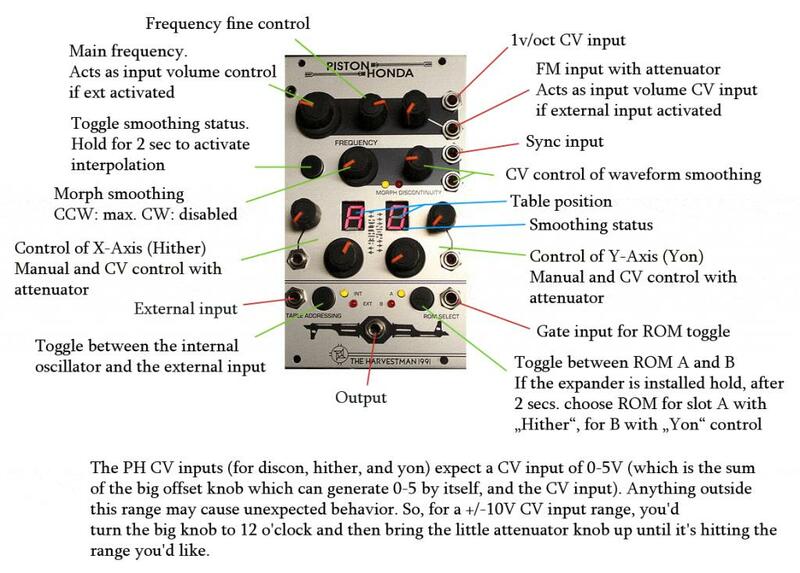 The PH CV inputs (for discon, hither, and yon) expect a CV input of 0-5V (which is the sum of the big offset knob which can generate 0-5 by itself, and the CV input). Anything outside this range may cause behavior like what you'd describe. So, for a +-10V CV input range, you'd turn the big knob to 12 o'clock and then bring the little attenuator knob up until it's hitting the range you'd like. Two things seem to happen when Morph Discontinuity is enabled. An extremely subtle low-pass filtering effect seems to be engaged that smooths out digital artifacting on the waveform, and the leftmost Morph knob becomes active. At extreme CCW the change between waveforms if the smoothing dots are lit is as smooth as possible. As the knob is turned CW, the amount of smoothing decreases. I think I read there are 12-16 levels of smoothing interpolation that can be created. The 4th jack from the top is CV in for MD. This is expecting 0-5V which is the sum of the left knob and the CV itself. I think that CVs outside this voltage range can cause strange behaviors even if MD isn't engaged. I get everything from a slight pitch drop to Yon bank glitches if I exceed 5V too much. This is the same effect I get if I hit the Yon CV too hard - Hither glitches. The discontinuity section works two ways. You tap the button to cause the decimal points to appear in the two numerical displays. If the display has the decimal point on, then the associated control has its wave travel smoothed (morphing between adjacent waves). When it is on, you can use the discontinuity knob to finely adjust the amount of "stepping" in this morphing, from totally smooth to simple jumps from wave to wave. The knob has no effect if none of the decimal points are lit. If you hold the button down for 2 seconds, the two orange LEDs will come on. This means the samples WITHIN each waveform are interpolated, causing some noise reduction. IÃ‚Â´ve updated the picture a bit. As always, texts & picture taken from the webz. thanks for taking the time to whip that up, very helpful info! IÃ‚Â´ve updated the picture a bit. as well as make that .jpg way back. i didn't even notice "frequency fine control" wasn't labeled before. i tried to word the description section to match the layout for the other actual harvestman manuals to attempt it being somewhat cohesive. and some from going through every thread that mentioned the honda. possibly a little duplicate info near the end, but whatever. if you didn't already, get your bsmith roms dan ham! Part of the reason i got out of eurorack is because some manufacturers promise manuals that never materialize except by other very generous people. I think it's incredibly lame to keep pumping out product but never take the time to put out a decent manual. (yes, written by the harvestman) you just had to look for it across many threads. Just wanted to say a big thanks to the users on this thread that posted info about the PH. Very helpful indeed! When expended, does the piston remember which rom chip was selected on power off? That basically means you'll change your patch each time (by moving the hither and yon knobs) to reselect the good rom? I hope the piston mkII will have that feature. Thanks for sharing this useful manual!!! Recently purchased a number of Malekko and Harvestman modules from Low-Gain here on Muffs. I'm still quite the newb, and while experimenting is fun, it's nice to have a foundation on where to start. Way past the 'don't plug outs to outs' stage, but it's nice to know what the intended purpose of some of the jacks and knobs are supposed to do or control. Especially the ones that are unlabeled or (to me at least) those with somewhat 'cryptic' descriptions. I have the original version of the PH, with the BS roms (that I didn't even know how to access...) This was the last guide or manual to locate. Thanks! I can't speak for the PHII as I don't have it and haven't looked close but I believe the v1 originally had two outputs on some of the mock ups, so I'm guessing that one of those was the dedicated output. Just a guess. Thought for a second I wasn't correctly flossing my Masonic handshakes with the proper amount of secrecy. oops. ive edited the post regarding the square wave output. you do have a good eye, i actually never noticed that part was wrong for years. i believe that bit was for the early prototype version. Ah oh well. I guess you could kinda get a square-ish version with a comparator. Just was wondering because a used mk.1 is on its way to me! it's been deleted from the site completely, and the last archived version still states "coming soon"
I know some users made their own, (THANKS!!) but it's far from complete. What do the "Morph" leds indicate on mk. 1?